And brave at a young age. With the wooden crossbow she made. She had no fear at all. “This is a cross between a wolf and a man. He’s wily, wicked, and dangerous too. 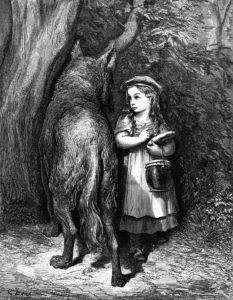 “Fear not, dear Gran,” Little Red said. “I’ll fetch the doctor. Go back to bed. Cloaked in a velvet red hood. Fearful of Little Red’s spear. A soft woosh betrayed his presence. Little Red sent two shots his way. A yowl of pain from the south. Little Red sent four more that way. Dripping blood like bread crumbs. At Little Red he lunged. Like a sheep skin rug. Without so much as a hello. Little Red stared in dismay. For the first time, she could not aim. Little Red used to see inside. That this was no longer Gran. This was truly some other monster. As she carried Gran’s body for burying. A new era for Little Red. Time to hunt predators instead.